Our M3 is now safely in the GRM world headquarters workshop after a long trailer ride from the Boston area to our Florida home. As always, our first job was to thoroughly clean and inspect our find--we carefully cleaned the car and pressure-washed the underside and the engine compartment. Years of accumulated filth were blasted off in an afternoon. The black seats were right on the edge of being unusable, with stress cracks from being not cared for properly. They received our immediate attention. First, we vacuumed and cleaned them with CRC Chemical's Tannery All Purpose Leather Cleaner. Next, we went to Wal-mart (America's sophisticated center for high-class auto repair) and bought every type of shoe polish and coloring agent they had. Fortunately, our seats were black, so matching the color was easy. We found what worked best was a $2 bottle of Kiwi Elite Premium Liquid Shoe Polish. We liberally doused the seats with this black liquid goop, let it dry overnight, and went back over the seats with CRC's Tannery Vintage Leather Cleaner and Conditioner. Unbelievable--the seats that we thought we were going to replace now look almost new. A month later, they still look just as good. We will just have to keep after them with leather treatment. From there is was off to Rennie Land. We made an appointment at Redline BMW to get the air conditioning fixed and to do a general tuneup and look-see. When we got the car up on Rennie's lift and he really looked over the car, he was genuinely impressed. The car wasn't as bad as we had first thought. Yes, the car still needs shocks and a host of other minor service items, but all in all we got a nice rust-free, accident-free 1988 M3. After doing a complete, professional tuneup with new wires, cap, rotors, plugs, valve adjustment, fuel filter and so on, we are still having a problem with an off-idle stumbling problem. At idle, the car runs perfectly. It also runs well from 5000 rpm to redline. When trying to cruise at 3000 to 3500 rpm, the car bucks and stumbles. 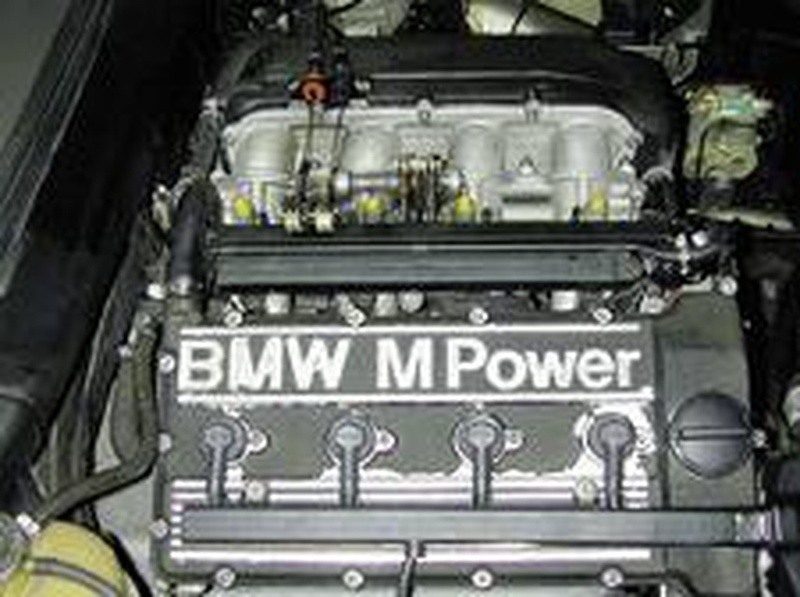 We know the M3 is known to be a little rough and buzzy, but we don't remember them running this badly. We are sure we can find the problem, and will report back when we figure it out.We have also ordered tires and wheels from The Tire Rack and a short-shift kit from Automotive Solutions as well as a few goodies from Turner Motorsports including adjustable cam gears and a chip. Once we fix our stumbling problem and get some good baseline numbers on the new Black Forest Tuning chassis dyno, we will begin to make some mods and see just how nice we can make an old M3. Look for another update soon, and this car's public coming out party is scheduled for the BMW CCA Oktoberfest the first week in October in Greenville, S.C.